Cyclophilin H (also known as peptidylpropyl isomerase H, PPIH) is a member of peptidyl-propyl cis-trans isomerase (PPIase) family, which catalyzes the cis-trans isomerization of proline imidic peptide bonds in oligopeptides and accelerates the folding of proteins. The cyclophilin H is a specific component of the human U4/U6 small nuclear ribonucleoprotein particle involved in the nuclear splicing of pre-mRNA. 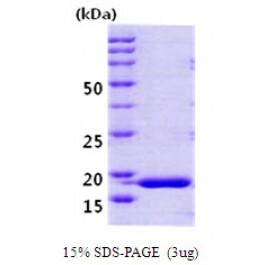 It stably associates with the U4/U6-60kD and -90kD proteins, the human orthologues of the Saccharomyces cerevisiae Prp4 and Prp3 splicing factors. The final concentrations are 200 mM Tris-HCl, pH 8.0, and 20nM chymotrypsin. 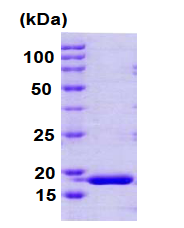 2.Add 10 ul of recombinant Cyclophilin H (PPIH) protein with 1 ug in assay buffer. 3.Mix by inversion and equilibrate to 1°C and monitor the A405nm until the value is constant using a spectrophotometer. 5.Record the increase in A405 nm for 30 minutes at 25°C. Store (in aliquots) at -20°C. Avoid repeated freezing and thawing. Recombinant human cyclophilin H was expressed in E.coli and purified by conventional chromatography techniques. 1 umole of suc-AAFP-pNA per minute at 25°C in Tris-HCl pH 8.0 using chymotrypsin.